v1.5.8 is mainly a compatiblity and security related release, as it fixes issues with WordPress 3.9 which is going to be released soon. It also includes improvements based on the second security audit by the City of Vienna. 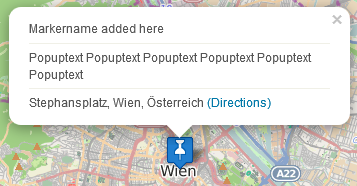 Nevertheless also lots of under-the-hood-improvements have been made, which make it easier especially for developers to utilitze the Leaflet API for specific maps or to more easily add custom styles. Please see below for more details. I would also like to invite you to join our affiliate program which offers commissions up to 50%. As the City of Vienna is planning to offer the usage of Maps Marker Pro to their customers, they carried out a comprehensive security audit. All discovered (potential) vulnerabilities were addressed and fixed with this issue. Therefore an update to v1.5.8 is – as always – recommended. Please note that your action is needed here if you changed the maximum width for images in popups! Just change max-width:234px !important; to the value of “maximum width for images in popups” you had before. Regular users will not be able to edit these form fields. Anyway the usage of this tool is only recommended when a new QR code background has been configured or if the URLs to the fullscreen maps have changed (e.g. by moving to another domain). If you want to contribute to translations (new Hindi translators would be appreciated! ), please visit https://translate.mapsmarker.com/projects/lmm for more information. Please note that translators are also compensated for their contribution – for example if a translation is finished less than 50%, the translator gets a free 25 licenses pack worth €149 as a compensation for completing the translation to 100%. Please understand that I am not being able to promise any release dates for new features. The roadmap for major new features (support for Google Street View with v1.6 and support for filtering of layers on frontend for v1.7) is still valid, I just would want to keep the flexibility to add optimizations and bugfixes with rather unplanned minor releases resulting mostly from users feedback. Please also see the roadmap for a rough schedule for planned features and please subscribe to this blog (via RSS or Email) or follow @MapsMarker on twitter (= most current updates) if you want to stay up to date with the latest development news. The easiest way to update is to use the WordPress update process: login with an user who has admin privileges, navigate to Dashboard / Updates, select plugins to update and press the button “Update Plugins”. No additional action on plugin update required.